A great variety of guidelines and regulations apply to mounting systems. But which ones actually make sense? Which ones have stood the test of time? Let’s take MSP installation on a commercial roof top as an example. This must be taken load reserves of flat roofs into account when planning solar power installations, due to they are quite limited. To provide orientation, testing and certification institutes, the Central Association of the German Roofing Trade (ZVDH) and the European Committee for Standardisation have published various guidelines and regulations in order to prevent damage to the supporting structures, roofing and insulation. The ten Eurocodes covering the planning and calculation of all structures in the construction industry. The assembly systems of the Ernst Schweizer AG are designed according to Eurocode 0 (Basics of Structural Design), EC 1 (General Effects on Structures, Snow and Wind Loads) and EC 9 (Dimensioning of Aluminium Structures). 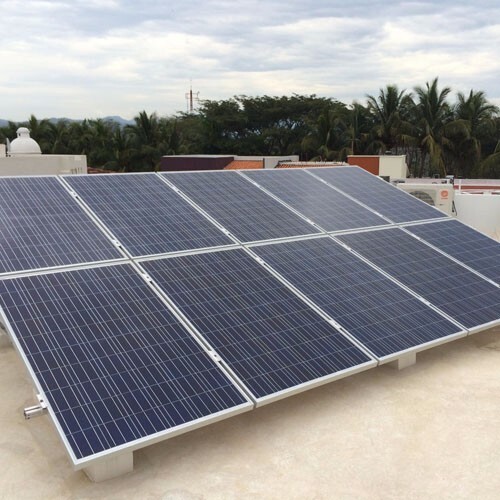 In order to prevent the solar installation from shifting, designers must take the coefficient of static friction between the solar installation and the roof into account when ballasting. This value depends on the building materials used and the condition of the surface, such as rough, smooth, wet and dry. The Swiss engineers tested the friction combinations of their substructures including fleece and roofing membrane. The Ernst Schweizer system meets the requirements of the Flat Roof Directive promulgated by the Central German Association of Roof Trading in 2016. The directive specifies how waterproof the roof is. For example, it lists the compressive stresses that different insulating materials can absorb.